From Sewing at Age 8 to Selling Designer Pram Liners! Behind the familiar whirl of her trusty Zinger sewing machine, Olga Abbott smiles contentedly as she feeds another piece of fabric under its glistening presser foot. The faint humming is imperceptible from the neat and unassuming street in Queens Park, WA where she lives; yet Australia has definitely noticed the fruits of this Mumpreneur Awards 2015 Finalist’s labour of love. 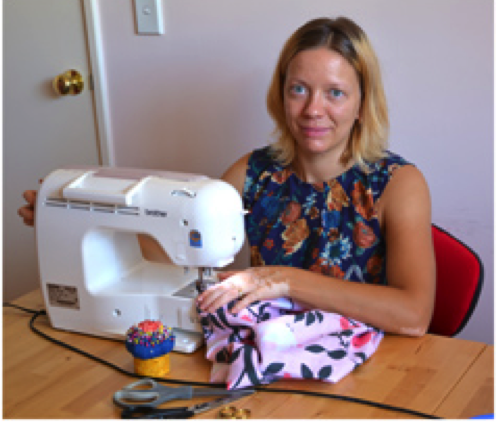 In just one short year, Olga has generated a consistent, growing income out of that humble stitching appliance with customised 100% natural cotton creations that put huge smiles on the faces of new mothers, newborn babies, toddlers, and their families all across Australia. Her designer fabricked baby items are popular as gifts from relatives, friends, workmates and business associates for new parents or a beloved little child. Here are Olga’s tips for creating a satisfying business doing what you love. Olga: I have always loved making useful things on a sewing machine. Since her grandmother first showed her how to sew her own apron on a mechanical Singer sewing machine from the bedroom of her childhood home in Russia, Olga has enjoyed churning out maternity gowns, baby clothes, pram liners and accessories for herself and as keepsakes gifts to family and friends. Olga: My business was born out of my desire to be a stay-home mum, and spend quality time with my child and husband. I love the flexibility of being a mumpreneur that allows me to take care of business while I take care of my family. Olga: could not find high quality ready-made baby items that met my standards for safety and comfort for my baby, and since I enjoy making my own on the sewing machine, I did. The first things I made were a African animals pram liner and matching cot linen set. Soon, my friends asked me to make some for their babies as well. My business grew because it was both fun and functional to give parents what they want–a wider choice of fabrics and everyday items that babies use, in the home and when they were out and about. Olga: I design, source for fabrics, and sew the items myself, and engage experts to help me with various aspects of marketing and business administration. I love talking to customers directly, in person at Expos and events or via Facebook, Skype, phone or email. I find it fulfilling to deliver something that looks smart, makes their parenting lives easier, keeps their babies safe and comfortable, and makes everyone happy. By: Elena is a mother and a small business owner, who is passionate about spreading the word about quality handmade products.